Living Space: 3000 sq. ft. 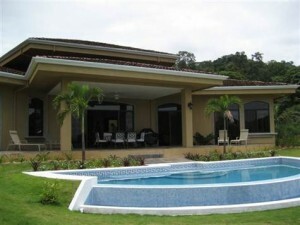 This incredible home is located on Costa Rica’s Southern Pacific coastline in Portalon and the prestigious “Hills of Portalon Estates” midway between Quepos and Dominical. It is aprox a 5 min drive to the newly paved coastal highway and another 5 min to the beach! Casa Naturaleza sits on an attractive 5 acre ocean view lot adjacent to one of the many forested reserves within the Hills of Portalon Reserve. The reserves are yours to protect and enjoy forever. Newly constructed in 2007, this extremely well built block ranch home offers about 3000 sq. ft with 3 full bedrooms, office, 4 bathrooms, living room, kitchen and dining room along with a complete wet bar. The expansive outside covered terrace takes you to pool side and the incredible infinity edge half moon shape pool. This home is completely furnished with high quality imported furniture throughout. Fine decorations adorn the walls and are included with the home. The beautiful wood vaulted ceiling in the dining room is a highlight and gives a feeling of openness throughout. 10 ft ceilings and large windows through the rest of the home offer you a feeling of a luxury home. The 5 acre titled lot is also part owner of the 150 acres of private jungle reserves located throughout the Hills of Portalon Estates. Various walking and horse trails are available to property owners. With only 28 home sites on 350 acres, you will always have the presence of nature and wildlife nearby. This, to be preserved in its original state for eternity due to the ecological restrictions the developer placed on the entire development. * The seller is open to offers and financing.